Foodie Magazines and Ruth Reichl’s Delicious! As it becomes easy to simply type into Google and run a search on any recipe you feel like making that day, the need to spend money on cooking magazines may seem unnecessary. Many magazines have gone extinct in their paper forms; a few years ago I mourned one of my favorites, Gourmet’s monthly print edition’s demise. There is something enjoyable about flipping through pages (whether real or virtual) and viewing the delicious full color images of meals you may not have considered trying otherwise. The library has a variety of foodie magazines that you can borrow. We keep the current and previous year, and all but the latest issues of the magazines circulate. And for those who prefer to view their periodicals on tablets or ereaders HPL/BCCLS offers digital magazines as well for download from our Zinio service. 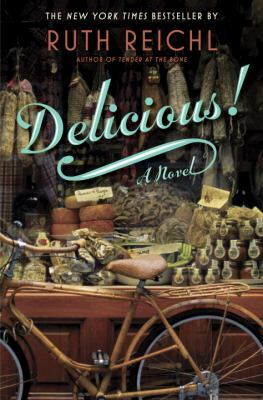 You can also check out Gourmet’s former editor Ruth Reichl’s new novel, Delicious!, set at a food magazine. Bon Appetit always reminded me of Gourmet’s hipper, younger brother. It has plenty of recipes that will impress for a dinner date at home or a summer party. In July’s issue learn about Adam Sachs’s clever creation of smoker for salmon and mozzarella made out of a filing cabinet and read a quirky interview of Community/The Soup’s Joel McHale. Learn how to make Shrimp and Fresh Corn Grits, discover recipes perfect for a Moroccan inspired feast, and concoct frozen cocktails made with fresh fruit! If you enjoy Bon Appetit, you might also like to check out Saveur available through Zinio. It is a feast for foodies with stories of traveling to world cuisine destinations, food trends, and quality recipes. If on the other hand you are looking for simpler home cooking download instead Taste of Home, which has easy recipes with pantry staples, often provided by the magazine’s readers. Pairing wine with food can make a good meal even more special, but for many wine can be an intimidating topic. HPL has two print magazines that can help you whether you are a connoisseur or a wine newbie. Wine Enthusiast magazine gives you a buying guide of wines from a variety of countries and at diverse price points for every budget. Beyond wine it also gives some coverage of beer and each month has a featured cocktail–August’s is an updated version of the Peruvian libation Pisco Punch. Also check out Food and Wine; the August issue features everything from an article on Native American Cuisine, a primer on Rose Wines, to even a short interview with Tori Amos. Even when you are watching your waistline food can still be enjoyable. Cooking Light has delicious recipes that are also good for you. Always interesting is the recipe makeover, which shows how you can take an unhealthy dish and reduce the calories, fat, salt, sugar, and other unhealthy ingredients, but still create something flavorful and delicious. This July’s issue, available in print from HPL, includes an articles on the hot topic of going Gluten-Free. Enjoy recipes for luscious peaches, tangy pickles, summer salsas, grilled meats, and more. You can also find some great easy and healthy recipes in Eating Well and diabetics can check out Diabetic Living available online for download from Zinio. Whether you are a vegetarian or are trying to reduce your meat consumption for health reasons, Vegetarian Times has great recipes that will have even carnivores not missing the meat. June’s issue includes some clever veggie tacos, home brewed sodas, and an article on Vegetarians Chefs in the United Kingdom. It along with another vegetarian magazine, VegNews are also available online through Zinio. Of course the library has a variety of other print magazines that include recipes as well that suit a variety of readers needs and lifestyles including Weight Watchers, Martha Stewart Living, Good Housekeeping, and Real Simple (all but Real Simple are also available from Zinio). Also from Zinio you can download Every Day with Rachael Ray and Food Network Magazine for fans of the food channel’s programming and recipes. Though Gourmet is no longer published, Ruth Reichl, who was the magazine’s editor for ten years, is still leaving her mark on the food world. Delicious! is Ruth Reichl’s first novel, but those who have read her nonfiction works will be familiar with her beautiful prose and mouthwatering descriptions of the food. The book’s protagonist Billie Breslin has dropped out of college and traveled across the country to New York to work at Delicious! (described as an iconic food magazine, one would presume it was inspired by her time at Gourmet). But then when Delicious! is suddenly shut down, Billie is the only staff member left behind answering reader complaints and questions from the magazine’s readers in the old converted mansion used as the Delicious! former base. When she discovers letters written by a twelve year old girl to James Beard during World War II, she finds not only a mystery, but also understanding about some of her own life’s dilemmas. Although some of the situations seem implausible, the quirky cast of characters and yummy food writing will make this a quick summer snack. I devoured it in two nights before bed, but it seems like it would also be a great beach read. I’m looking forward to trying to bake up Billie’s signature Gingerbread recipe, which is included and sounds scrumptious. Stop by the library or click on Zinio link on our homepage to read about and cook up something new today!